Two persons dupe 161 job aspirants in Hyderabad. A deputy engineer working on Mission Bhagiratha and an advocate practising in the Telangana High Court were accused of duping 161 job aspirants by collecting money on the pretext of providing jobs in L&T Metro Rail in Hyderabad. Two persons, V. Ramakrishna and his live-in partner C. Mahalakshmi, were arrested as part of the fraud. A search is on to nab deputy engineer B. Laxman Rao, who is posted in Mancherial, and advocate G. Sridhar Reddy. Ramakrishna is Laxman Rao’s brother-in-law. Police said that in 2017, one T. Lavanya, a resident of Dilsukhnagar, came in contact with Ramakrishna, a former public relations officer with various companies. He lured her and several others with the promise of jobs in Hyderabad Metro Rail with the contacts he had developed over the years. Police said in all 161 aspirants were promised the jobs and Ramakrishna allegedly collected the money on behalf of the ring. In all the gang collected about `80 lakh from unemployed youths and distributed it among the members. On realising she was cheated, Ms Lavanya moved the Uppal police who began investigations. The police found that Ramakrishna had 15 cases registered against him in the Telugu states for for cheating job aspirants. “Mahalakshmi and Laxman Rao provided SIM cards to Ramakrishna to talk to aspirants and persuade them to pay the money. Sridhar Reddy helped in getting details about Metro Rail officials. Ramakrishna, who knew mimicry, impersonated the voices of Hyderabad Metro Rail vice-president and HR department personnel and issued fake call letters,” an Uppal police official said. When the candidates approached Metro Rail with the fake job letters, they realised they had been cheated. 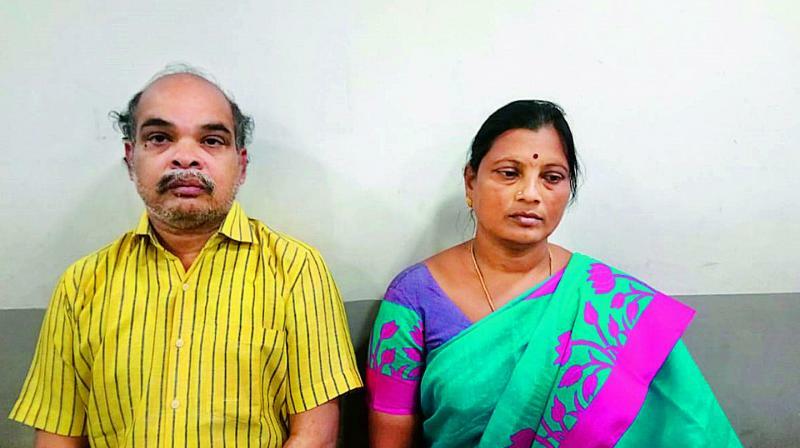 Police seized a car, two phones, fake job order copies of 161 victims, and Rs 70,000 cash from Ramakrishna and Mahalakshmi.